Community members get samples from various local food vendors at the fourth annual Taste of Evanston. This year’s event primarily benefited local nonprofits Connections for the Homeless and Reba Place Development Corporation. More than 500 community members filled their plates and stomachs Sunday evening at the fourth annual Taste of Evanston. 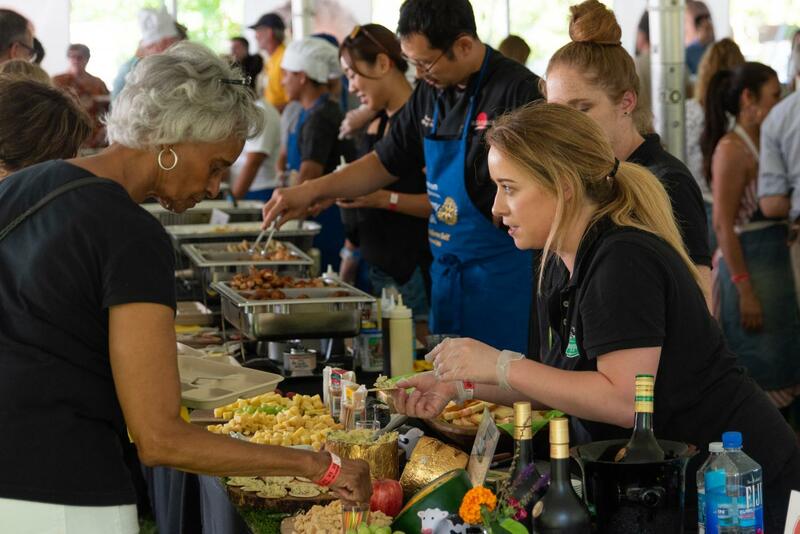 The event, hosted by the Evanston Lighthouse Rotary Club, featured about 40 different vendors on the east lawn of the historic Charles Gates Dawes House. Hoosier Mama Pie Company, Boltwood, Tomate Fresh Kitchen and Hecky’s Barbeque were among the local restaurants at the food festival, which primarily benefited local nonprofits Connections for the Homeless and Reba Place Development Corporation. Vince Gerasole, CBS Chicago anchor and Evanston resident, emceed the event and a jazz band, the Jonah Karsh Quartet, performed throughout the evening. This year’s theme was “Hungry for Home” because both beneficiaries specialize in helping community members who are experiencing homelessness or are in need of affordable housing. Reba Place Development Corporation specializes in rehabilitating buildings and making them into affordable housing spaces for families, executive director Adrian Willoughby said. He stressed the importance of community to the organization. Willoughby announced that with the funds raised at Sunday’s event, Reba Place will be creating a community space in their building named the Lighthouse Rotary Room. Connections for the Homeless serves those who are homeless or threatened with homelessness in Evanston. The organization offers housing services to community members, in addition to various other services, such as job preparation and food and clothing drives. Belton now works with Connections for the Homeless on an advocacy committee in order to give back to the people who helped him, he said. He added that he is grateful to everyone at Connections for the Homeless and everyone who has donated to the organization for helping him and the greater Evanston community.